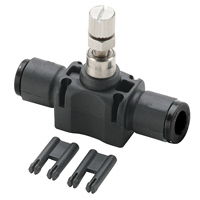 The compact body size of our flow control valves make them ideal for small circuits where space is limited. Our highly sensitive adjusting screws allows fine settings to meet the precise demands of any application. The locking nut will accurately hold the required setting even under high vibration conditions. "Push-In" connections allow easy and quick connections to or disconnections from nylon, polyethylene and 95A durometer polyurethane tubing. Composite - Flow Control Regulators.